Written by chris maroulakos on Thursday, April 26th, 2012 at 9:30am. Following the physical endurance test that was Saturday, attendees at the Coachella Valley Music and Arts Festival on Sunday waited as long as possible before shuffling onto the sun-baked Empire Polo Club field. The previous day had peaked at a soul-rending 107 degrees, so Sunday’s high of 102 felt comparatively balmy. By the time the last notes of Wild Flag’s “Romance” rang through the desert air, there were only a couple more hours of daylight left and already plenty of shade for attendees to enjoy. Sweden’s The Hives took to the main stage around six, decked out in their signature top hats and tails in flagrant disregard of the Indio climate. Despite the formal attire, the ragtag group still managed to seem disheveled as it launched into “Try It Again” from The Black and White Album. Singer Howlin’ Pelle Almqvist screamed and sneered his way through the song, backed by Chris Dangerous’ speed-bag percussion. Almqvist relentlessly worked the audience. He ordered attendees to scream, flattered them for being superior to the previous weekend’s crowd, and informed them how much they truly loved The Hives’ music. The frontman’s excessive banter oscillated between amusing and tiresome, his marble-mouthed delivery simultaneously evoking Eddie Murphy, Mitch Hedberg, and Borat. But when The Hives weren’t running out the clock with idle chatter, they were working the crowd into a sweatier sweat with their high-octane punk. From the falsetto screaming and buzz-saw guitar of “Main Offender” to the Blur-y chord progression of radio hit “Hate to Say I Told You So” (which made the crowd go certifiably nuts) the band delivered one of the festival’s most energetic, manic sets. 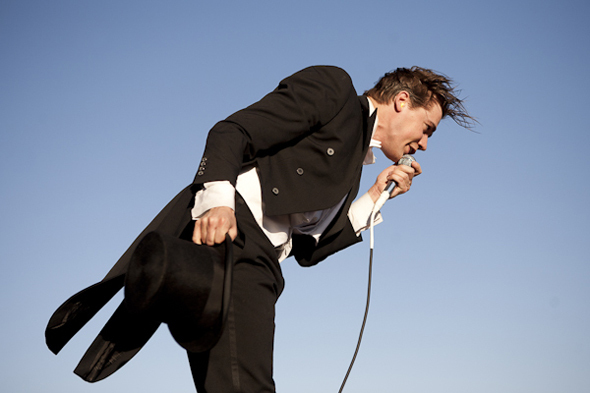 The Hives may not have the most original or complex songs around, but they did sound like they ate ten lesser bands for breakfast, and that kind of intensity is never boring. After The Hives’ set, a healthy mixture of bass and manure wafted over from the neighboring Sahara as attendees from all over the festival grounds converged on the Mojave tent to see breakout star Gotye perform. The decision to put the Belgian-Australian singer in the Mojave was clearly made before the song “Somebody That I Used to Know” became the #1 single in America — the crowd that gathered for Gotye’s set stretched far and beyond the borders of the small tent. From what little could be seen and heard past the vast sea of sweaty heads and Ninja Turtle novelty backpacks, Gotye did indeed perform.